November begins the autumnal celebrations. The harvest has come in and the fruits of the summer’s labors are still bountiful. The many family get-togethers are being planned and food preparations are under consideration (and maybe debate). Knowing what we do about the limbic system, we can begin to understand how the various aromas associated with the holidays can affect our moods and outlook on life. Each spice or herb has a therapeutic property to it, so even if you are using the spice in powder form and not as an essential oil, it still can have a psycho-emotional effect. A favorite in the autumn is pumpkin pie. Being so full of many different spices, it in itself a feast for the limbic system. All the spices that are added to the pumpkin contain a wealth of health during a time when we can potentially overeat. For the most part, the pie spices all aid in digestion, relief of flatulence and bloating. But they all, also, have properties that increase mental ability, encourage conversation and a sense of unity. And best of all, these many spices assist in making an autumnal party fun because they are all natural aphrodisiacs. Of course, the amount in a pie may not be enough to have a physiological effect on the body, but the smell itself is enough to trigger lots of feel-good hormones. 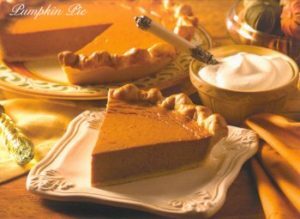 It was noted in one study by neurologist Alan Hirsch, M.D., and other researchers at the Smell and Taste Treatment Research Foundation in Chicago, that pumpkin pie’s aroma was found to produce a 40% increase of sexual arousal in men. It also scored in a high percentage with women! So I thought it would be fun to breakdown what each individual spice in a pumpkin pie targets in the body. Cinnamon is warming and stimulating as a spice and an essential oil. It aids in digestion, soothing the bloated stomach and alleviating flatulence. It enlivens the mental processes and activates sexual arousal. Cinnamon also helps lift depression, promoting creativity and a sense of fun. The odor invigorates, strengthens, energizes and focuses the mind. Ginger is an appetite stimulant, also warming and balancing. It encourages confidence, empathy and courage while combating confusion, apathy, burnout, sadness and sexual anxieties. Supporting the heart emotions, it brings a romantic feeling to a gathering and being a yang oil it has been known to help with male impotency. Nutmeg is needed to warm the spirits and soothe the digestive tract during this time of year. It aids in the relief of flatulence and indigestion, calming nausea and stimulating gastric juices so that the breakdown and assimilation of food is more productive. Nutmeg is said to ease the inconvenience of diarrhea and the associated bloating and gas. It is alleged to be an aphrodisiac, increasing sexual urge by relaxing and easing nervous stress and tension therefore heightening libido. Allspice is a lot like clove in that is warming and spicy, stimulating digestion, aiding in relief of flatulence, nausea and cramps. It eases fatigue, stiffness, chills, aches and pains. Because it is a tonic for the liver, it buoys depression and releases stress/ tension. By relaxing, one has more time for pleasure, so it is also considered a mild aphrodisiac. In October, pumpkins are carved for Halloween, but in November, pumpkins are for pie making. So this year, when you inhale that gorgeous spicy aroma, close your eyes for a moment and feel what happens in your body. Sense those feel-good hormones rushing though your blood, and smile, knowing this pie is going to do a lot more than just taste good!! !